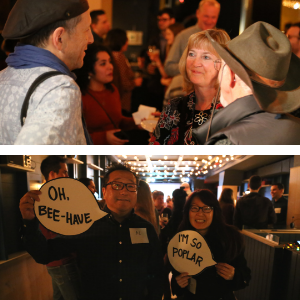 LEAF volunteers, project partners, board members and staff came together for a delightful night of celebration and mingling as we reflected on our many TREEmendous accomplishments of 2018! 2018 has been an epic year at LEAF, and we could not have had such an impactful year without our community of dedicated volunteers, amazingly supportive project partners, and our enthusiastic board of directors. 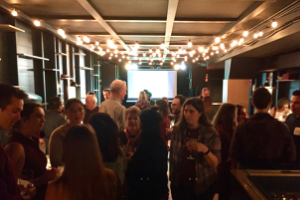 On the evening of Tuesday, November 27th, we took a moment to gather with this remarkable group of people to reflect on and celebrate our collective hard work. We met at Burdock Brewery to share some delicious craft beer and locally sourced nibbles. We extend an enormous “thank you” to Burdock for supporting this lovely opportunity for the LEAF community to spend an evening together. Not only is Burdock a superb local restaurant and brewery with a music hall and bottle shop (you have to try their beer… if you like beer! ), they’re also proud tree adopters in the Bloordale Adopt-a-Street-Tree Project. We could not have had such a charming event without their generosity. Thank you, Burdock! 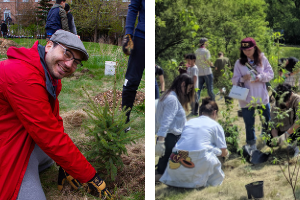 Volunteers assisted at 8 planting events in Toronto and York Region, planting 2180 native trees and shrubs with over 900 participants. 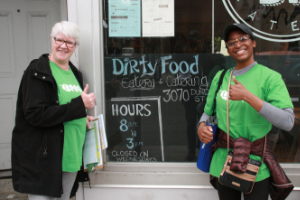 Our team of outreach volunteers attended 47 events in the GTA, reaching 2520 people with our urban forest message. 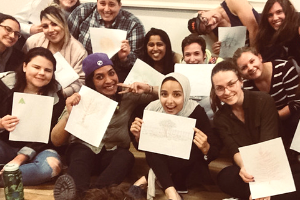 Twelve Young Urban Forest Leader program participants undertook a five-month volunteer engagement where they helped to amplify the benefits of the urban forest by assisting to establish and support Adopt-a-Park-Tree projects in Centennial Park, Guild Park and Trinity Bellwoods Park. Activities included mulching newly planted park trees and leading educational tree tours where over 155 people attended. Our dedicated Garden Stewards continued to care for our six Urban Forest Demonstration Gardens, contributing 440 volunteer hours to help keep these important spaces beautiful! 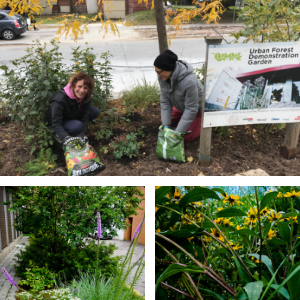 Volunteers in the Junction and in Liberty Village helped ensure that street trees were regularly cared for by local businesses through the Adopt-a-Street-Tree program. Over 150 trees have been adopted in the two project areas. These are just a few of the wonderful things we have achieved together over the past year. In total, over 5000 hours of volunteer time were contributed by our volunteers to help accomplish LEAF’s programs. We could not be more grateful to have such a passionate, knowledgeable and dedicated team of amazing people. Thank you to every single volunteer that has been part of our work in some way. At our evening celebration, we had an opportunity to give a shout-out to our project partners and supporters. These folks are an essential part of our LEAF community. 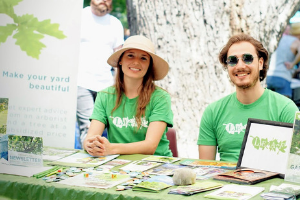 Their financial and in-kind contributions are vital to LEAF being able to meet our mission to grow and sustain the urban forest by providing quality services and programs that engage the community. Thank you again to our entire community of supporters. Wishing everyone a relaxing and restful winter season. We look forward to another unbeLEAFable year in 2019! Learn more about becoming a LEAF volunteer and, if you haven’t already, sign up for our free electronic newsletter to stay informed about 2019 volunteer orientation sessions. Erin McDonald is the Community Programs Manager at LEAF.